successful student transfer experience, as it begins with counseling and articulation, and ends with evaluation. Grossmont College was one of 12 community colleges out of 16 honorees to be recognized throughout California, and it was also the only college or university in San Diego and Imperial counties to be honored. 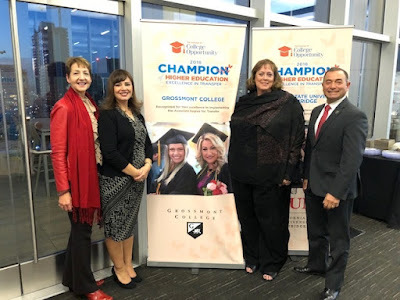 In addition to significantly increasing the number of Associate Degrees for Transfer awarded, institutions were also recognized for enrolling those students at a California State University with junior status and graduating Associate Degree for Transfer earners with a bachelor’s degree. The other recognized institutions include: Moorpark College; Pasadena City College; Orange Coast College; College of the Canyons; Long Beach City College; East Los Angeles College; Berkeley City College; Glendale Community College; Clovis Community College; Citrus College; Golden West College; California State University, Dominguez Hills; California State University, Northridge; California State University, Los Angeles and California State University, Stanislaus. The Associate Degree for Transfer was created via legislation in 2010. Sponsored by then-State Sen. Alex Padilla, the historic transfer reform legislation created a clear pathway for students to earn an associate’s degree and guarantees admission into the California State University system. To date, more than 100,000 students have earned an Associate Degree for Transfer, and of those that enrolled in the California State University, they earned a bachelor’s degree almost twice as fast as other transfer students, according to the Campaign for College Opportunity. The Campaign for College Opportunity is a California nonprofit bipartisan policy and research organization focused on a single mission: to ensure all Californians have an equal opportunity to attend and succeed in college in order to build a vibrant workforce, economy and democracy. For more information, visit www.CollegeCampaign.org, Facebook.com/CollegeCampaign or follow @CollegeOpp.